Today is Friday, December 13th. I do not like Friday the 13th. I realize that I am not alone in this. There are a lot of people who don't like Friday the 13th. Superstitions and bad luck and all of that. But I'm not superstitious. 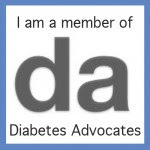 I was diagnosed with Type 1 Diabetes on Friday, August 13th, 1993. So any time there is a Friday the 13th, I think about that day. It was the day of my 10 year checkup. My pediatrician is the one that made the diagnosis of T1D. Thankfully, he caught it before I got any sicker. My blood sugar was only in the 500s at diagnosis. I know a lot of people get diagnosed with a much higher blood sugar than that. Thanks, Dr. N.
Since today is Friday the 13th, I've been thinking a lot about my diabetes. Hoping I don't see anything over 300, unlike the last two days. I think I will always dislike Friday the 13th. But the thing is, I know this date doesn't hold any real power. Or mean anything. It's just another day. And today, I choose to focus on the good things this disease has brought me--friends. Bring it, Friday the 13th. You don't scare me.